(18.10.2016) The South Korean government must take heed of a major appeal court ruling and stop criminalizing conscientious objectors, said Amnesty International today. 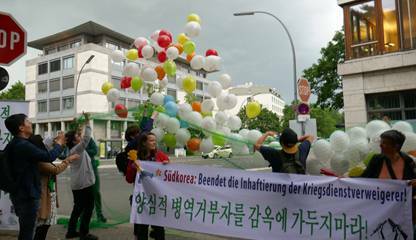 Appeal court judges in Gwangju, south-west Korea, overturned the guilty verdicts of two conscientious objectors, Cho Rak-hoon and Kim Hyung-geun. It is the first time an appeal court has reversed guilty verdicts in a conscientious objectors case. “The appeal court has sent a clear message that conscientious objection is not a crime. The government needs to act on the ruling and stop punishing young men who refuse military service on grounds of conscience,” said Hiroka Shoji, East Asia Researcher at Amnesty International. The young men were sentenced to 18 months in prison for refusing military service at their original trials in June 2015 and May 2016, respectively. The appeal court also rejected prosecutors’ calls to convict a third conscientious objector, Kim Hye-min, who was found not guilty at his initial trial in May 2015. 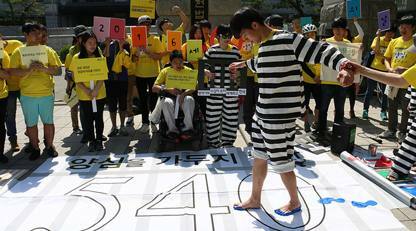 More people are imprisoned in South Korea for their conscientious objection than the rest of the world put together, with at least 399 men, mostly aged between 20 and 24 years old currently in jail. The government continues to fail to comply with international standards by refusing to introduce a genuine civilian alternative to compulsory military service. South Korea’s Constitutional Court is expected to rule soon as to whether the law which criminalizes conscientious objection violates the country’s constitution.